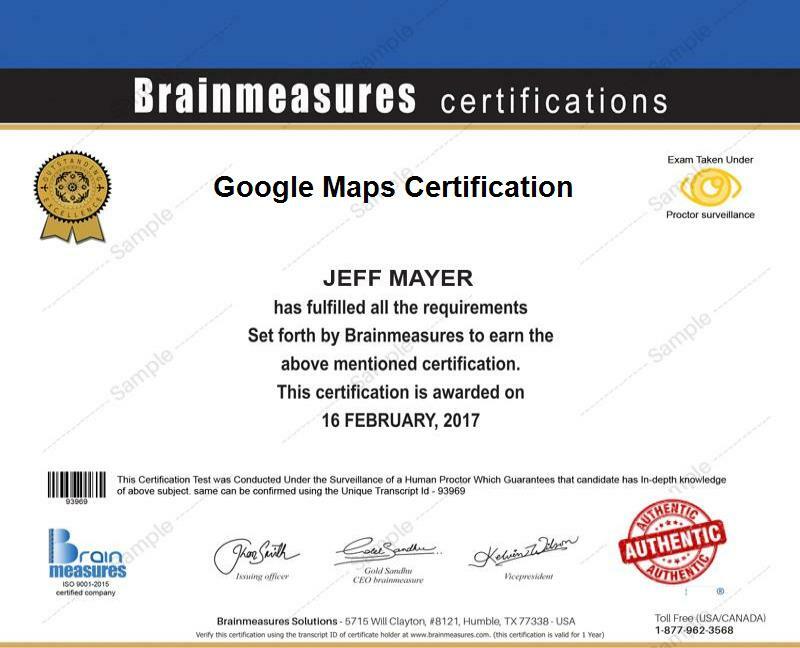 If you want to improve your knowledge and proficiency in the field of using Google Maps, then the Google Maps certification program which is now available at Brainmeasures is highly recommended for you. Enrolling in the Google Maps course offered by Brainmeasures is a major help especially if you desire to hone your skills in navigating the application and in learning more about its most useful features and start using them to your greatest advantage. The certification course can offer you a well-detailed Google Maps training which covers all the aspects about the application including the functionality of the Google Maps API 3 version. The learning materials used in the program are proven to be high in quality, updated and accurate so you have an assurance that you will come out as a real expert in the field as soon as you become a certified professional in using Google Maps. As soon as you complete your Google Maps certification course and receive your certificate, it will be easier for you to prove to various business organizations that you are proficient in using the app. The Google Maps certification program offered by Brainmeasures is highly detailed enough that it allows a lot of individuals and professionals to be greatly benefited by it. The certification program is primarily designed for anyone who wishes to become more proficient in using Google Maps and Google Maps API especially Version 3. It is most suitable for web designers and developers, consultants, moonlighters, programmers and professionals working in software companies who want to further hone their skills in creating maps using Google Maps and effectively navigate this specific application. Google Maps certification holders can also expect to enjoy a higher level of salary upon completing their certification course. If you have successfully completed your Google Maps certification course, then you can use your skills and knowledge in Google Maps to work as a GIS mapping specialist which will let you earn around $57,000 per year. If you decide to work as a web-based mapping applications developer, then note that this profession will let you receive as much as $82,000 salary per year. Working as a software mapping engineer gives you the opportunity to earn around $77,000 to $85,000 annually.